This story was produced by the Choteau Acantha as part of The Montana Gap project, in partnership with the Solutions Journalism Network. Retired Browning, Montana, educator Larry Woolf spent 11 years as a teacher and 15 as a guidance counselor in public schools on the Blackfeet Reservation. He has seen, again and again, the devastating pain of teenage suicide. “Working in the schools, I’d gone to enough funerals for kids,” he said in an interview this spring. The pain of losing those young people motivated Woolf to become a trainer in a new mental health program for teenagers — a program he hopes will sharply reduce the rate of teenage suicide in Montana. Woolf is now a certified trainer and classroom presenter for the Youth Aware of Mental Health program. Called “YAM” for short, this suicide prevention program originated in Stockholm, Sweden. Carli also said YAM is a prevention program, not a treatment program. “It’s like a vaccination,” he said. Every student who takes the Youth Aware of Mental Health five-class program receives a booklet filled with mental health care resources. Woolf said the program addresses mental health issues and vocabulary in the first of five one-hour classes. 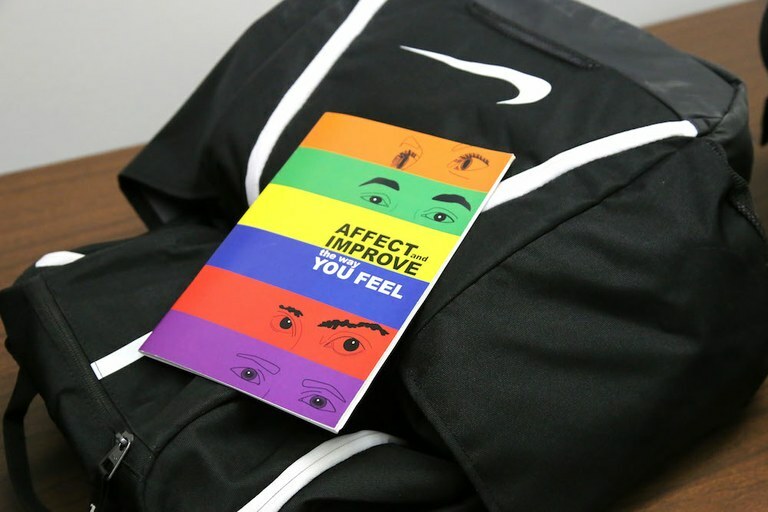 After the first class, the presenter then leads students through role-playing scenarios designed to teach them empathy, to show them how to recognize signs of mental illness in themselves and others and how to reach out for help. All the students also receive a booklet filled with contacts for mental health-care resources. One of the hallmarks of the YAM program is that outsiders, not regular school faculty, teach it, and it is largely student-driven. The students in each class personalize the role-playing programs and use them to address their specific needs. Woolf’s hopes are for the YAM program to have the same positive results in the United States as have been documented in Europe. The National Center for Suicide Prevention has solid evidence of YAM’s effectiveness that came out of a huge trial. The Center received a 3 million Euro grant to launch one of the largest, cluster-randomized control trials ever to study the efficacy of YAM and two other suicide prevention programs for 14- and 15-year-olds. Between Nov. 1, 2009, and Dec. 14, 2010, the researchers enrolled 11,110 students in 168 public schools in 10 European nations in the “Saving and Empowering Young Lives in Europe” trial. In April 2015, the researchers published the results of the trial in The Lancet peer-reviewed medical journal. The results showed that YAM performed the best of the three programs. YAM reduced suicide attempts in students by 55 percent over the control group one year after the students took the classes. Further, the students who took YAM reported a 50 percent reduction in severe suicidal thoughts, compared to the control group. 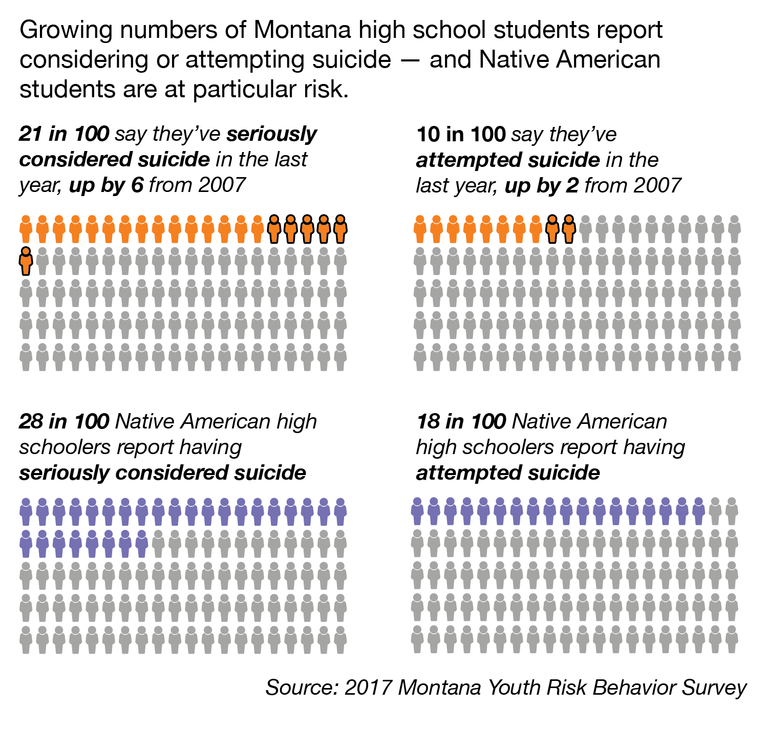 Woolf and other educators and mental health professionals interviewed for this article all said Montana faces a double challenge: Not only does Montana have one of the highest teenage suicide rates in the nation, but it also has a scarcity of mental health-care professionals. According to the 2017 Youth Risk Behavior Survey, during the 12 months before the survey, 20.8 percent of Montana high school students seriously considered suicide and 9.5 percent had attempted suicide. A whopping 18.3 percent of Native American students in Montana had attempted suicide one or more times in the 12 months before the survey. 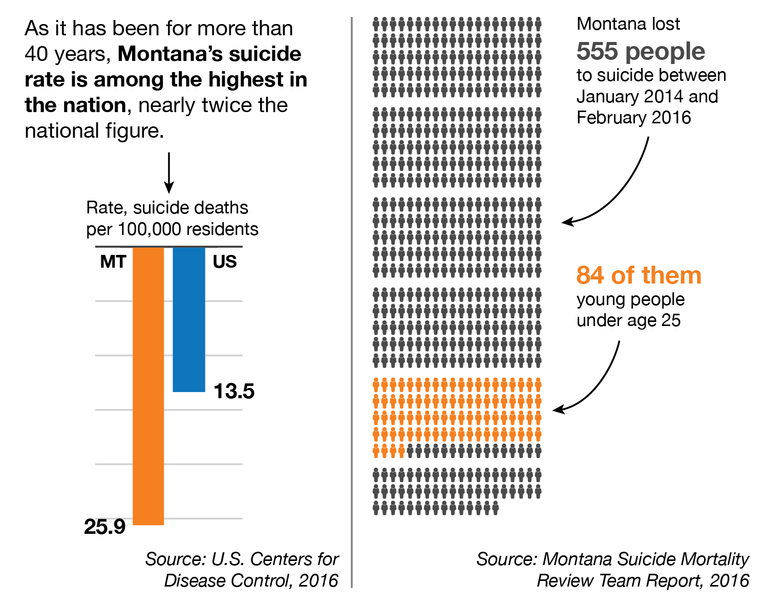 Montana’s bleak youth and adult suicide statistics motivated the formation of the Center for Mental Health Research and Recovery on the Montana State University Bozeman campus in 2014. Center Director Matt Byerly, a psychiatrist with expertise in mental health research, joined staff in August 2015, only a few months after reading The Lancet article on YAM. Byerly contacted the YAM researchers and asked them to collaborate with him to bring YAM to the United States through pilot programs in Montana and Texas. He wants to see whether the European YAM results can be replicated in Montana public schools. He obtained a $300,000 grant from the Montana Research and Economic Development Initiative to fund a pilot program to offer YAM in eight public high schools, ranging from very small to very large. Five of the schools had a general population and three were majority Native American schools. While Byerly said the center is still compiling results from the pilot program, initial results were so encouraging that he reached out to MSU Extension to expand YAM by training Extension agents, present in all 56 of the state’s counties, to offer YAM in rural schools as part of their jobs. Byerly worked with Sandra Bailey, Ph.D., a professor of family and human development with MSU Extension in Bozeman. They received a $326,000 Rural Health and Safety Education grant from the U.S. Department of Agriculture and a $92,000 grant from the Montana Mental Health Trust. She saw YAM as another class Extension agents could offer. They already teach classes on heart disease and diabetes, for example, and many agents are trained to teach Mental Health First Aid. Extension is also involved in a randomized-controlled trial of Thrive, a computer-administered Cognitive Behavior Therapy program designed to provide help to adults with depression. In 2017, Bailey asked for volunteers from among the state’s 90 Extension agents and 17 of them agreed to be trained. The Extension volunteers then taught YAM classes without extra compensation (Their assistants were paid an hourly wage). Bailey’s agents have now taught YAM to more than 600 freshmen and sophomores in 14 rural schools. In the 2018-19 school year, she hopes to add as many as 15 more schools. When she asked the agents who taught the classes this year whether they wanted to teach again next fall, she got a great response. “They know how to do it, they believe in it, and they are committed to teaching it again,” she said, adding that she hopes to have several more agents trained this summer. Bailey has grant funding to expand the program in the 2018-19 school year and will continue with the center to work to secure funding for the future. 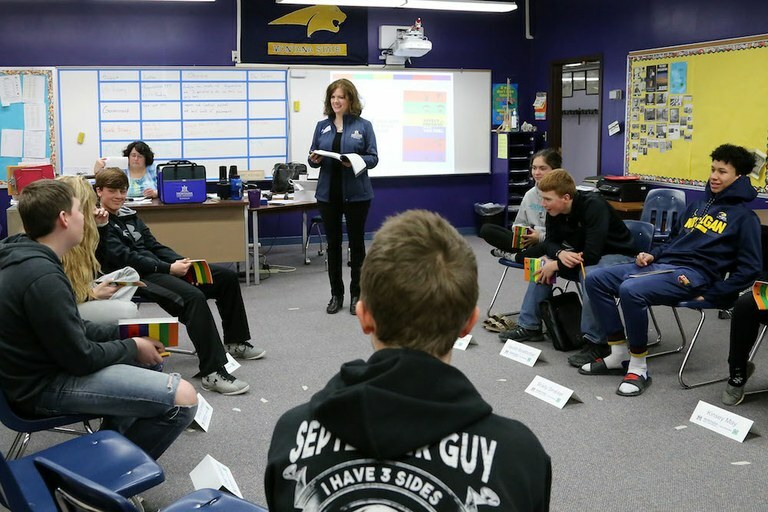 Jane Wolery, a Montana State University Extension agent in Choteau, teaches Power High School students the Youth Aware of Mental Health Health program last May. She particularly likes that YAM allows teens to practice some of the messy “firsts” that, without any experience, can be very stressful: falling in love, breaking up, dealing with underage drinking. Students tackle these issues through “dilemma” cards that set up a scenario and roles for the students to play. Elsah Bechtold, a 15-year-old freshman at Choteau High, said the booklet of resources will be at her fingertips, and she will use the experience she gained from the role-playing to help guide her responses to real-life situations. “I think I learned more about how to act in social situations that were kind of odd,” she said. Bailey and Byerly said school administrators across the state have been very supportive in working to bring the YAM program to their schools, but there are limitations. Someone has to pay for the program and space in the school day has to be found, for example. Wendi Hammond, the principal for seventh through 12th grades at CHS, said it took some work with the ninth and 10th-grade English and biology teachers to find a place for YAM, but it was well worth the effort. “There’s no research that shows bringing speakers in for a one hour rah-rah is going to help anyone,” she said, but YAM is evidence-based with impressive results. Fairfield High School Principal Dustin Gordon said YAM fit the school’s need to offer a suicide prevention class. “With teenage suicide on the rise, everyone wants to think that in small-town, rural Montana that stuff happens somewhere else, but it doesn’t,” he said. Gordon and Hammond both said they want YAM to become a regular part of the ninth-grade curricula, whether offered through Extension or the school itself. Byerly said the most formidable barrier to expanding YAM to all students in Montana is the cost of delivery. The cost per student receiving the program is about $80 to $130, and to offer YAM to all ninth graders in Montana would cost $1.5 million per year to pay for wages, materials and licensing fees. While Gordon and Hammond are confident their schools could offer the program with or without outside funding, Woolf was not as sanguine the class will be offered in Browning Public Schools next year as funding is uncertain. Byerly and the center are continuing to seek grant funding to help expand the program. This spring, the center received $157,000 in grant funding from the state to bring YAM to Great Falls Public Schools in the fall.